The Staff is amazing, helped us build the whole equipment. The equipment design is robust and aesthetically sound. Loved the quality of material used. for instituions, corporations and foundations. The TARA PaperMek®	- I is a simple to use technology designed and marketed by TARA Machines; specially for schools. 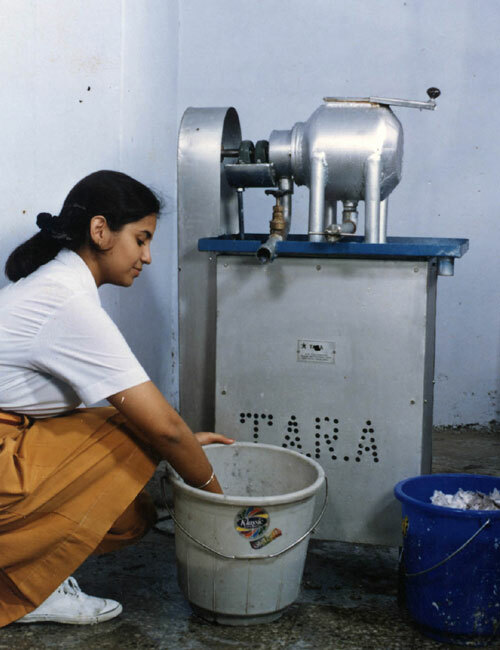 The TARA PaperMek - I creates awareness about the ease of recycling. The Do-It-Yourself system recycles waste paper into usable paper. The unit is operated by school children themselves with creativity in paper making through addition of biomass, use of natural colours and fragrances. TARA Hydrapulper 1 Kg per charge The TARA Hydrapulper is fabricated with high grade stainless steel; the input material can be shredded paper from which pulp is prepared. Why should you choose TARA PaperMek® - I ?